Everything is made of atoms ... Everything that animals do, atoms do. ... There is nothing that living things do that cannot be understood from the point of view that they are made of atoms acting according to the laws of physics. In The Feynman Lectures (1963), 8. I think equation guessing might be the best method to proceed to obtain the laws for the part of physics which is presently unknown. If we go back to our chequer game, the fundamental laws are rules by which the chequers move. Mathematics may be applied in the complex situation to figure out what in given circumstances is a good move to make. But very little mathematics is needed for the simple fundamental character of the basic laws. They can be simply stated in English for chequers. In The Character of Physical Law (1965), 36. On the contrary, God was always invented to explain mystery. God is always invented to explain those things that you do not understand. Now when you finally discover how something works, you get some laws which you're taking away from God; you don't need him anymore. But you need him for the other mysteries. So therefore you leave him to create the universe because we haven't figured that out yet; you need him for understanding those things which you don't believe the laws will explain, such as consciousness, or why you only live to a certain length of time—life and death—stuff like that. God is always associated with those things that you do not understand. 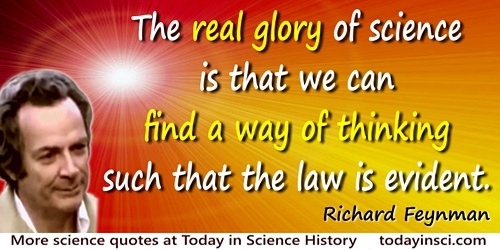 Therefore, I don't think that the laws can be considered to be like God because they have been figured out. Quoted in P. C. W. Davies and Julian Brown (eds. ), Superstrings: A Theory of Everything? (1988), 208-9. One of the ways of stopping science would be only to do experiments in the region where you know the law. 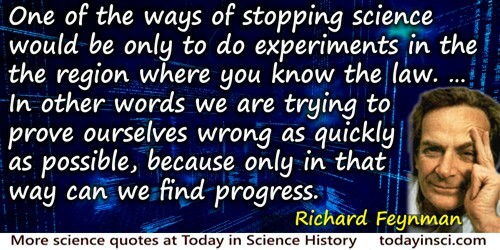 … In other words we are trying to prove ourselves wrong as quickly as possible, because only in that way can we find progress. In The Character of Physical Law (1965, 2001), 158. In The Feynman Lectures in Physics (1964), Vol. 2, Lecture 20, p.20-10 to p.20-11. “Conservation” (the conservation law) means this … that there is a number, which you can calculate, at one moment—and as nature undergoes its multitude of changes, this number doesn't change. That is, if you calculate again, this quantity, it'll be the same as it was before. An example is the conservation of energy: there's a quantity that you can calculate according to a certain rule, and it comes out the same answer after, no matter what happens, happens. 'The Great Conservation Principles', The Messenger Series of Lectures, No. 3, Cornell University, 1964. From transcript of BBC programme (11 Dec 1964).